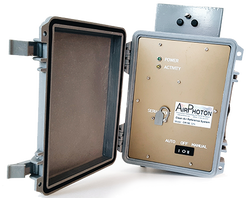 ​The AirPhoton 3-wavelength Integrating Nephelometer measures the light scattered by particulate matter, over the angular range from 7o to 170o. Employing an innovative design, the forward and backward scattering measurements are made completely independently. 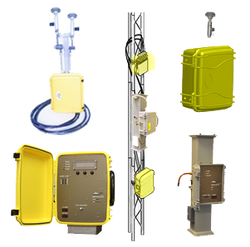 ﻿The AirPhoton Filter Stations are fully programmable and offer a robust design, making them field deployable immediately. Our stations offer filter options making sample collection easy while lowering the risk of sample contamination. AirPhoton's Combined Filter Stations provide you the highest quality measurements at a lower investment existing instruments. Our compact and robust design allowing field deployment without the need for specialized environmental chambers. ​Our Filter Stations are built to fit your specific needs and allow for AC, Battery or Solar Power capabilities and offer filter options making sample collection easy while lowering the risk of sample contamination. The AirPhoton 8-slot filter cartridge is a unique design that holds and protects 8 particle sampling filters. This design minimizes the handling of the filters in the field and reduces the frequency of site visits by technicians. Besides looking fashionable, an AirPhoton Custom Case keeps you organized while protecting your equipment. They are built tough and will take a beating, Our cases are outfitted with wheels and a retractable handle for easy transport.